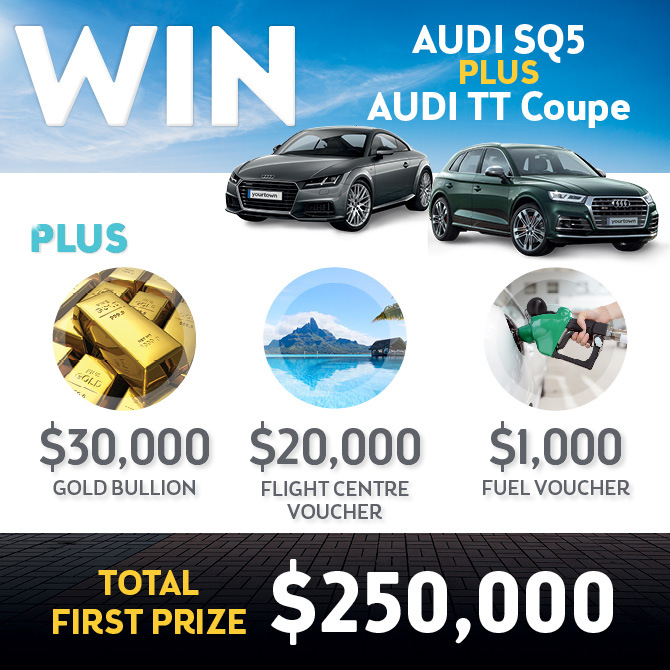 WIN 2 Audis + $51K of Extra Prizes! Purchase tickets in this draw and you could be our next winner, just days before Christmas! Imagine two new Audis in your garage for Christmas: the Audi SQ5, PLUS the Audi TT Coupe - PLUS $51,000 of Extra Prizes. No need to choose - they could both be yours for just $10! Hurry! With tickets only $10 each and limited to 130,000, they are sure to sell out. Entries close 19 December 2018. Drawn 21 December 2018. "I'm excited for the winner of this year's yourtown Christmas Prestige Car Draw, taking home not one, but two high performance and dynamic Audi vehicles to enjoy every day." Could all this be yours? Celebrity designer Darren Palmer loves the effortless elegance of Audi. The Audi SQ5 blends high-performance engineering with practical versatility. In an Audi TT Coupe, the journey is more exicting than the destination. The SQ5 features a 3.0L turbocharged 260kw petrol engine, 21" sport alloy wheels with red brake callipers, and fine Nappa leather seats. You'll love the experience of driving the Audi SQ5. The Audi TT Coupe features the Audi Virtual Cockpit, a powerful 2.0L turbocharged petrol engine, electronically operated rearspoiler, and lightweight construction with a unique design inspired by the iconic Audi R8.